Colorwarepc.com is entirely an online E-commerce business, therefore the website needs to ensure that their customers information will remain 100% safe from the time which it is submitted. 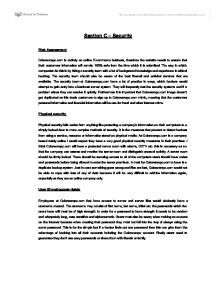 Section C - Security Risk Assessment Colorwarepc.com is entirely an online E-commerce business, therefore the website needs to ensure that their customers information will remain 100% safe from the time which it is submitted. The way in which companies do this is by hiring a security team with a lot of background knowledge and experience in ethical hacking. The security team should also be aware of the best firewall and antiviral services that are available. The security team at Colorwarepc.com have a lot of practice in ways, which hackers would attempt to gain entry into a business server system. ...read more. It is the measures that prevent or detect hackers from using a service, resource or information stored on physical media. As Colorwarepc.com is a company based solely online I would expect they have a very good physical security measures in their premises. I think Colorwarepc.com will have a protected server room with alarms, CCTV etc. this is necessary as so that the company can assess and monitor the server room and distinguish unusual activity. A server room should be firmly locked. There should be securing access to all of the computers users should have codes and passwords before being allowed to enter the server premises. ...read more. The username may consist of first name, last name, initial etc. the passwords which the users have will must be of high strength. In order for a password to have strength it needs to be random and adequately long, case sensitive and alphanumeric. Users must also be weary when making an account on the Internet because when creating their password they must not fall into the trap of always using the same password. This is for the simple fact if a hacker finds out one password then this can give them the advantage of hacking into all their accounts including the Colorwarepc account. Finally users need to guarantee they don't use easy passwords or share them with friends or family. ...read more. In summary, the report is quite good. The sections are quite short, however there do give detailed information. Some area's do need a little altering though, to improve the level of the report. The report mentions how a business may hire a security team, however this is only one option. The business will have the option of implementing this in-house (if there have the skills required within their own employees), to undertake the work required. The report states how a back-up should be made to ensure that any data loss can be restored by using the back-up. However it's important to state that any back-ups should be around 100 miles away from the original data, as the data will need to stored in a secure location away from the original data. This would ensure that if there were a flood within the area, the data would still be recovered. This would show the examiner the potential risk, and the solution to this situation occurring. The presentation of the report is quite good, as the report clearly shows the three sub-heading which allows the examiner to read each section clearly and with ease. The report could include an screenshot of the website, to allow the examiner to visualize the student's though of mind. required, the frequency of their production, their layout and they data they will contain, will be included. Input Designs will be included, defining where all of the data is coming from, method of data input, data collection methods to be used, data-capture form design and input-form design. However, using this navigation bar you can not look for films you want to buy, apart from the top 20 films of the week. For finding a film you would need to use the search facility at the top (as shown on the right). In order for Cuckoo Games to make the most of E-Commerce it is essential that they have a website that looks professional, easy to use and is eye catching and grabs your attention. Although having a professionally made website can be expensive to have produced but Cuckoo Games will greatly benefit from a professional website rather than a cheaper alternative. I used the cloning tool to make a copy of part of my original graphic so that it could make a smooth animation. The grouping tool was used to assemble certain images together into one cluster. This enabled me to move a group of images in one movement, which saved time. A wider range of stock can be offered for sale online and orders can be filled as they come in, which saves money on warehouse costs. It also reduces the risk of over ordering on a product that doesn?t sell well. Preventative measures In order to effectively remove threat to customer data, there must be a thorough analysis of all possible threats, no matter how big or small A transactional website should perform a risk assessment. This will help them understand what exactly threatens their operation. She finally left her job after several months of working there, as she had accumulated enough income to finally go off to university where she went to study home economics and IT. Throughout these years Caroline earned the skills needed to create very complex website's and be able to understand several server based languages such as php and aspx. as possible so that the poor would made every effort possible to try and find work, this was called "less eligibility"; and thirdly each Union was to have paid officials to operate the system, who were appointed by the voluntary Board of Commissioners.